Thirty years ago, a person of means could walk into an import car dealership, drop a sum that would double the average annual household income, and drive out with a grand touring coupe—a two-door, four-seater powered by a prodigious, smooth, naturally aspirated engine. These luxurious cars coddled passengers in leather at triple-digit speeds while still making the twists and turns of the road with ease. American car companies produced their own version of the grand touring vehicle, such as the Cadillac Eldorado and Lincoln Mark VII—as well as “personal luxury coupes,” the Buick Riviera and Chrysler Cordoba. Slightly smaller and less expensive import vehicles such as the BMW 6-Series, Lexus SC400, and the Acura Legend Coupe were also popular among managers, real estate agents, and legal professionals. But if you are talking about the holy trinity of the 1980s touring car, they are the Jaguar XJ-S, Porsche 928, and Mercedes 560. These vehicles were built as flagships, the pinnacle of performance and technology. These cars were for wealthy executives, country club members, and people on the board of directors, and they communicated class and sporting elegance loud and clear. Today, most contemporary carmakers have pulled out of the big GT coupe market, but the 1980s dream of imperious personal luxury survives. As values increase, it makes sense to rescue one and revel in it. The three vehicles have all escalated in value in the past five years and are slated to continue to do so in the near future. For now, though, the entire trio can still be had for the price of a new, entry-level BMW. 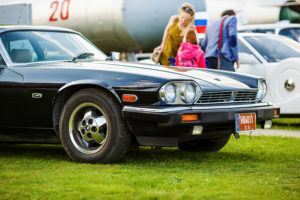 Black Jaguar XJS 1984 model year. An XJ-S in decent condition will run around $10,000, and even a pristine one will barely crest $25,000. But these values are up 25 percent over the past five years, and the car has made multiple lists of up-and-coming classics. As with most collectibles with a long production run, the ones that are increasing in value fastest are the earliest models—for their originality—and the most recent ones, for their sophistication. one. But that doesn’t mean you shouldn’t. While the 911 still looks stuck in its Beetled past, the 928, produced between 1978 and 1995, has an uncanny breadth, angularity, and curvy profile that will always look like the future. And its complex V8 (ranging from 228hp to 345hp, depending on the model year) can really pull. At the end of their run, these were among the fastest and most expensive production cars on the road. 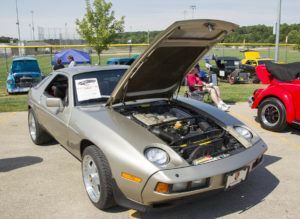 The 928 has finally come into its own. [Full disclosure: I own a 1978 928.] Values are up 70 percent over the past five years, but one in decent condition will still set you back only $25,000. The later cars are far quicker and more luxurious, and those are the ones that have escalated most in value. But they also come encumbered with weight, spoilers, and intakes that mar the visual purity of the original design. The value play is the earlier ’80s models. 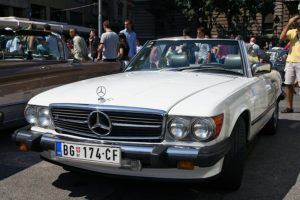 the Mercedes-Benz 560 SEC, produced from 1985 to 1991, have begun to look downright avant-garde. Few vehicles have the despotic beauty of these 238hp, V8-powered coupes, much less their imposing, tank-like engineering. The Benz is the true value play here. Although produced over a much shorter period of years, and in smaller quantities than the other two examples, you can pick up a model in decent condition for less than $8,000, and a pristine one goes for around $15,000. Prices are up only 5 percent in the past five years, but this kind of slow growth happened to the earlier models of Benz coupes, too, and they’re now six-figure cars. This is the early adopter of the trinity, the one to get now before it gets noticed. It will get you noticed.